Police have detained two people after a group of soldiers was almost hit by a car while they were jogging near their barracks in south-eastern France. Soldiers of the 7th Mountain Battalion managed to avoid the oncoming vehicle in Varces-Allières-et-Risset. The driver shouted in Arabic at the soldiers before the attack, and sped off afterwards in what reports said was a Peugeot 208 with fake number plates. Reports suggest a woman was also in the car. No-one was harmed. Police tweeted to say a man had been detained in a Grenoble market after a search operation. In a separate tweet, police said they had also detained the owner of the car in Échirolles, a suburb south of Grenoble. Prosecutors in Grenoble said the attack was not being treated as a terrorist incident. The incident came the same day that four victims of a hostage-taking at a supermarket in the south-western town of Trèbes were buried. The gunman, Radouane Lakdim, began his attacks on 23 March near Carcassonne by firing at local police officers who were out for a jog, injuring one of them. Police stormed the Super U supermarket after Lakdim took hostages there, and shot him dead. His 18-year-old girlfriend has been charged with being part of a terrorist conspiracy. French army spokesman Colonel Benoît Brulon confirmed Thursday's attack, saying the man had "verbally threatened" some soldiers who were starting their morning jog, before trying to ram them as they returned. The 10 soldiers managed to get out of the way of the car, which sped off after the attack. 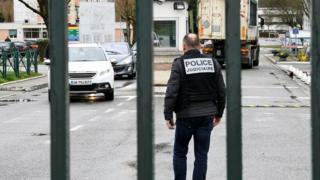 France remains on high alert after a number of terror attacks in recent years, although in October last year President Macron lifted a state of emergency in place since 2015.